The Eye-Pal is a camera device that attaches to a computer. 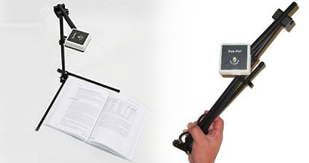 Faster than a flatbed scanner and weighing in at just 1 lb., Eye-Pal is a portable USB scanner/reader that instantly converts printed material into speech, text files or refreshable Braille. Eye-Pal may be used with the most popular Braille displays from Freedom Scientific, Optelec, and Handytech. Eye-Pal may be purchased for use with a PC or Mac computer. The Eye-Pal ROL (Read Out Loud), is designed for comfort, portability, and ease of use. This ergonomic design combines fast, highly accurate scan and read technology with other features into one portable electronic reader. A pair of headphones easily plugs into the front of the device for privacy, and the ergonomic thumbwheels and tactile controls are intuitively located for ease of use. This lightweight, battery-operated, electronic reader is Braille-display compatible so you can read a book on the couch, go through a menu at a restaurant, or fill out a form at the doctor’s office. 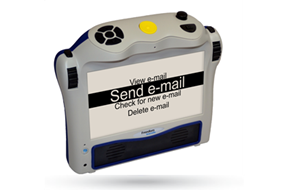 The Eye-Pal ROL incorporates our exclusive AudioMinder technology, making it the only reader that can also assist you with your daily schedule. AudioMinder allows you to set an alarm and record appointment reminders. The Eye-Pal ROL weighs just 3.5 pounds, making it easy to carry and easy to use. Stay independent with Eye-Pal ROL. 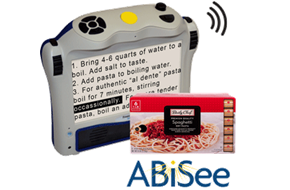 The Eye-Pal Ace has a built-in screen to display photos, magnify small objects, and enlarge text. This battery-powered, lightweight product weighs only 3.5 pounds. The ergonomic design makes it easy to read a book on the couch, go through a menu at a restaurant, fill out a form at the doctor’s office, and accomplish a multitude of other tasks. Stay independent with Eye-Pal Ace. 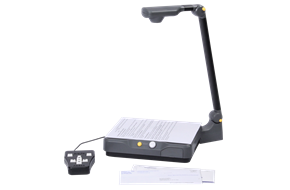 The Eye-Pal® Ace Plus is a portable scanner, reader, and video magnifier in one lightweight, battery-operated device. 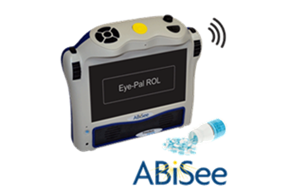 The Eye-Pal Ace Plus also has a simple one-button, spam-free, email system to keep you connected. You can navigate your email with the simple controls or attach a voice message or audio labeled picture with the push of a button. The built-in WiFi connects to Bookshare® and NFB Newsline® so you can download books and access publications. Read your magnified books and publications or listen to them being read aloud. Use our exclusive AudioMinder to set an alarm and get an appointment reminder. A pair of headphones easily plugs into the front of the device for privacy, and the ergonomic thumbwheels and tactile controls are intuitively located for ease of use. You can also upload your photos to a photo album with audio labels. The Eye-Pal Ace Plus weighs only 3.5 pounds, making it easy to carry and easy to use. Stay connected, informed, and independent with Eye-Pal Ace Plus.